Long Vehicle Circus is in Czech Republic absolutely unique project that combines art of walking on high stilts with an elements of dancing, acrobatics, mime and clowning new. The beginning of the project dates back to the second half of 2009, when we came to the conclusion that just walk on stilts, and live with head in the clouds is not enough. 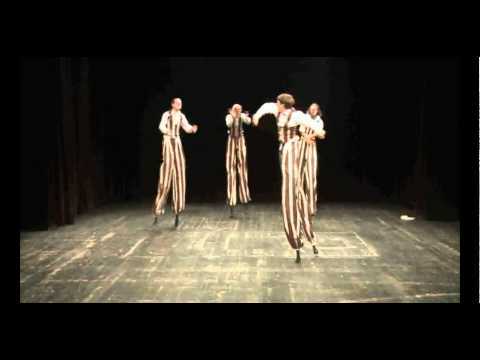 Graduates of the Prague Academy of Music under the direction of Adam Renč created the first stilts´s show, which premiered at the Czech National Day at Expo 2010 in Shanghai. Long Vehicle Circus is an open project, combining live music, mime, drama, dance, clown shows, the site-specific projects. Condition remain high stilts, and 1m high is the minimum. Producer of Long Vehicle Circus is ART Prometheus, art guarantors are Jiří N. Jelinek, and Adam Renč.